"Es la primera vez q compro pero mea gustao mucho como lo an enviado y la..."
Amethyst geode from Brazil. This amethyst geode with cave shape measures about 32 cm high, 19 cm wide, 14 cm deep and weighs approximately 7,960 kilos. The amethyst points of this geode are purple with quartz base. It has a beautiful agate layer encircling the crystals cavity. Unique piece. Amethyst geoda chapel type. Amethyst Geode with a format called "Chapel", characteristic of Brazilian amethysts. With an approximate weight of 9,800 kg, it measures about 31 cm high, 19 cm wide and 16 cm deep. 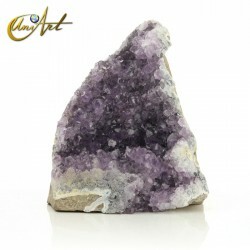 Using amethyst chapels to attract good vibrations is widespread in Feng Shui. The Amethyst is considered the stone of spirituality. Unique piece. Amethyst is a macrocrystalline variety of the quartz crystals. Its violet color, sometimes intense, depends on the amount of iron (Fe+3) it contains. In this case, being amethyst geodes, this crystal is grouped into a cavity. Regarding its color, it may be colored by areas with transparent or yellow quartz. The points of amethysts tend to be darker or degraded to the colorless quartz. 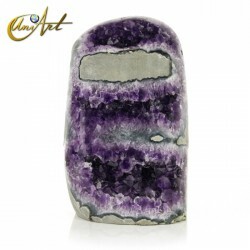 In UniArt you can buy the amethyst druse you like the most at the best price with an excellent quality and beauty.